2020 Home Show is January 17-19 and is located in the Pinnacle Bank Expo Center! Founded in 1975, the Central Nebraska Home & Builders Show is held annually in Grand Island, Nebraska. Visitors to the show can see the latest products and services displayed by exhibitors to assist them in building and improving their home and yard. 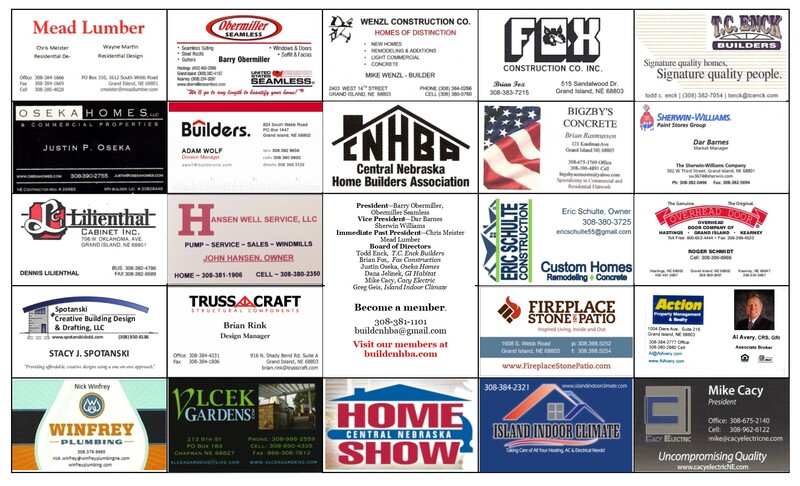 The Central Nebraska Home & Builders Show has thousands of ideas to help make your house a home! Click HERE for more information. This event is sponsored by the following member businesses. The Jim Roth Memorial Golf Tournament is an annual event that raises money for the Jim Roth Memorial Scholarship. Central Nebraska Home Builders Association has established this scholarship in memory of Grand Island Home Builder Jim Roth. Roth built homes in and around Grand Island for several years, including many homes in the Brentwood area. Roth was active in the Home Builders Association and did much to promote the construction trades and Central Nebraska Home Builders. He lost his life prematurely in a plane crash. As a thank you to Roth, the Central Nebraska Home Builders Association have created this scholarship as his legacy. The scholarship is a one-year award given to a graduating senior of a Hall County High School and ranges between $500-$750. Proceeds from the golf tournament also benefit students attending Career Pathways Institute and students involved with Skills USA Nebraska. You must register for this event in order to attend.